American buffalos conjure up images of the Midwest, of vast plains and frontiers, of a young America taking shape, and this is the setting that Donna the Buffalo excels in. Tara Nevins (vocals, acoustic guitar, fiddle, accordion), Jeb Puryear (electric guitar, pedal steel), Mark Raudabaugh (drums), David McCracken (electric keyboard, organ), and Kyle Spark (electric bass) are leaders of “The Herd,” what zealous fans of their music are known as. Stringing together bluegrass, reggae, country, folk, and Crescent City sounds, Donna the Buffalo remain true roots music purveyors, collaborating with artists as disparate as David Hidalgo (Tex-Mex), Mamadou Diabate (kora player), and Bela Fleck (banjo player). 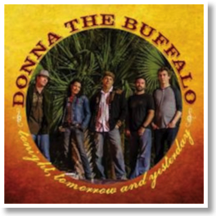 Recording since 1989 but with several line-up changes, Donna the Buffalo release their latest outing, Tonight, Tomorrow and Yesterday, after 2008’s nicely-received Silverlined. Sticking to vintage analog tape, with few overdubs as needed, the 14-track record gives the comfort of earthiness that roots-flavored fans are familiar with. The chugging “All Aboard” sets the pace for old-time textures but drops to a steady country rhythm in “Don’t Know What You’ve Got.” From here on, the listener will experience alternations of male- and female-fronted lead vocals and both danceable and calming sounds. Secret Canon Vol. 2, Dayna Kurtz’s new album is steeped in some bold New Orleans flavors. Christened Female Songwriter of the Year by the National Academy of Songwriters, Kurtz’s distinct style traverses many genres. This album uniquely reflects her musical versatility and the energy of her newfound home in New Orleans. After this cheeky opening, the listener prepares for a wild ride. Kurtz unravels a soulful and poignant narrative with unexpected curveballs along the way. The track, “Reconsider Me,” exposes the voice and its message with sparse accompaniment along with mournful, yet fierce vocals. The song fades out at its climax, hinting at its permanence. Though many of the songs harbor grave undertones, Kurtz infuses the album with unaffected confidence. The release comprises references to several different genres and eras, but the authenticity of her voice erases any boundaries the genres pose. With this new album, Kurtz has immersed herself in the musical and cultural roots of New Orleans. The CD shares a story of passion and raw strength without apology.